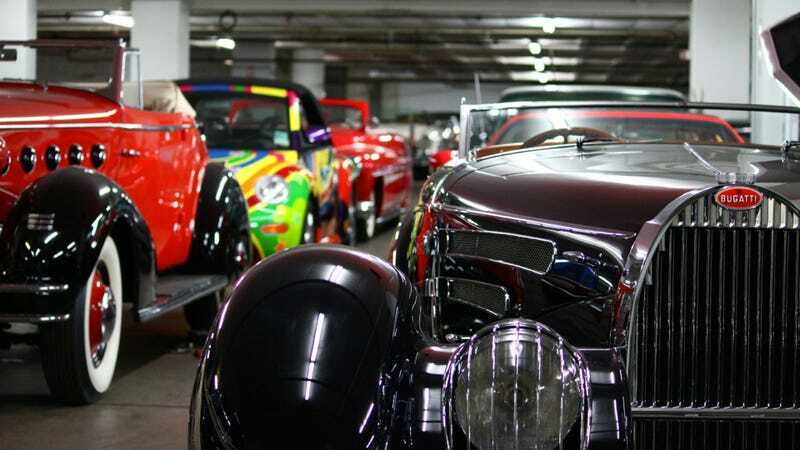 The Petersen Museum is a gem for car lovers, preserving and displaying some of the world's most important and interesting cars. Below the museum is "the vault" a.k.a. the Fort Knox of the automotive world. It's where they hide the collection's fascinating mobile artifacts in between exhibits and store cars they don't know what to do with. Now you can access what only a select few have ever seen. To be fair, if you're a journalist or well-connected you can get into the basement. I've done it, and came back with the story of Elvis and his fatly Pantera. Our own Jason Torchinsky went there on a date, but that was before they fixed the locks. For the next moth, approximately, you simple and unimportant citizen can get in there without knowing someone or having a magical old Volvo P1800 key. For an additional ticket purchase of $25 they're offering a guided tour of the vault between December 15th and January 6th. The 150-or-so cars on display include a Ferrari given to Henry Ford II by Enzo Ferrari, Steve McQueen's Jaguar XKSS, and more vintage Bugattis than you'll see outside of a Concours. They may also have Saddam Hussein's personal car. The price is steep but it's entirely worth it.